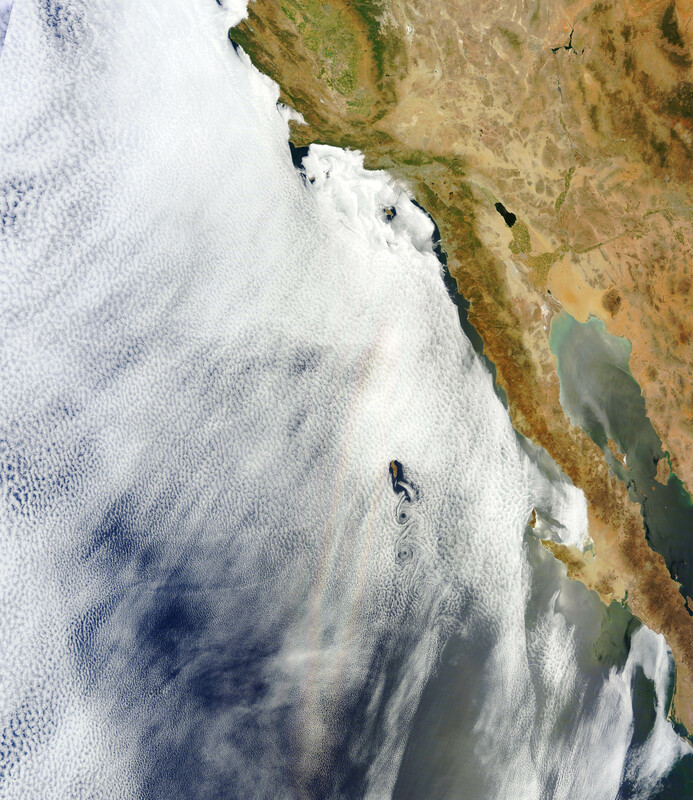 An optical phenomenon known as a “glory” is seen over a cloud-covered Pacific Ocean in this image from NASA’s Aqua satellite, acquired on June 20, 2012. Although the colors may make it look like a rainbow, the process behind its formation is somewhat different. As vortices spiral off the leeward side of Guadalupe Island, off the western coast of Baja California, a shimmering spectrum of colors highlights a glory just west of the island. Glories are created when light from the Sun reflects back toward an observer off water droplets within clouds or fog. They are often seen from airplanes as a bright ring of light encircling a silhouetted shadow of the aircraft below, but are also visible from the ground and, sometimes, even from space. Although glories may look similar to rainbows, the way light is scattered to produce them is different. Rainbows are formed by refraction and reflection; glories are formed by backward diffraction. The most vivid glories form when an observer looks down on thin clouds with droplets that are between 10 and 30 microns in diameter. The brightest and most colorful glories also form when droplets are roughly the same size. From the ground or an airplane, glories appear as circular rings of color. The space shuttle Columbia observed a circular glory from space in 2003. In the image above, however, the glory does not appear circular. That’s because MODIS scans the Earth’s surface in swaths perpendicular to the path followed by the satellite. And since the swaths show horizontal cross sections through the rings of the glory, the glory here appears as two elongated bands of color that run parallel to the path of the satellite, rather than a full circle. Click here to download the full-size image. NASA image courtesy Jeff Schmaltz, LANCE MODIS Rapid Response. Read more here. The latest views of Earth from NASA’s Aqua and Terra satellites are looking a bit hazy from wildfires burning in wilderness areas of the United States and Siberia. The above image acquired July 18 from the Moderate Resolution Imaging Spectroradiometer, or MODIS, aboard the Terra satellite, shows a whopping 198 wildfires burning across Siberia. 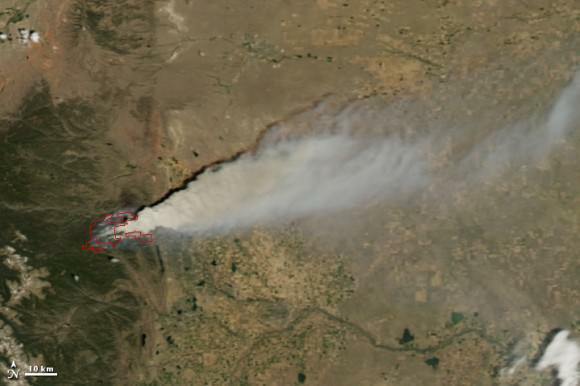 You can view more of this huge fire at NASA’s Earth Observatory website. The fires have charred an area of more than 83 square kilometers. Some of the fires were started by people who lost control of agricultural fires but some fires were started by lightning. Besides measuring the smoke plume and fire extent, much can be learned using satellite images of wildfires. Types of vegetation can affect the type and color of smoke emitted by the wildfire. Grassland fires tend to burn quickly and give off carbon-rich black smoke. Forest fires where moisture is higher give off thicker smoke; a combination of organic rich ash and water vapor, that ranges in color from brown to bright white. On the plus side for weather buffs, each of the fires have produced rare pyrocumulus, or fire clouds. Wildfires and volcanos can produce these dramatic clouds as intense heating causes the air to rise. As the rising air cools, water vapor in the ash cloud condenses just like a normal cloud. The ash particles provide nuclei for water to condense. Sometimes this moisture will fall back on the fire as rain. Dave Lipson, a meteorologist with the National Oceanic and Atmospheric Administration told the Denver Post that calm and clear weather along Colorado’s Front Range made the towering pyrocumulus cloud look especially menacing Tuesday. Tuesday afternoon, the lone fire cloud could be seen from 40 miles away from Denver. Well, not the sky exactly, but definitely in the clouds! This image, acquired by NASA’s Aqua satellite on June 5, shows an enormous oval hole in the clouds above the southern Pacific Ocean, approximately 500 miles (800 km) off the southwestern coast of Tasmania. The hole itself is several hundred miles across, and is the result of high pressure air in the upper atmosphere. The northwestern tip of Tasmania and King Island can be seen in the upper right of the image. The Aqua mission is a part of the NASA-centered international Earth Observing System (EOS). Launched on May 4, 2002, Aqua has six Earth-observing instruments on board, collecting a variety of global data sets about the Earth’s water cycle. Read more about Aqua here.